Wilson says the water both cured and prevented further concussion. IN A PROFILE published on Wednesday in Rolling Stone, Russell Wilson offered a peculiar answer to how he recovered from a head injury he suffered during the Seahawks’ NFC Championship victory over the Green Bay Packers. He claimed that Reliant Recovery Water, a sports drink with “nanobubbles” that Wilson has invested in, helped cure the injury, an assertion that his agent, Mark Rodgers, downplayed. Wilson claimed that the $3 bottle of water (which contains nanobubbles and electrolytes and claims to help athletes recover faster after workouts) also healed a teammates knee injury, on top of preventing his own concussion. Proven through scientific research, using recovery water will help reduce pain and inflammation from your active lifestyle; accelerate recovery from injury and muscle related stress; decrease fatigue for higher energy during activity; speed muscle recovery after activity; and deliver better hydration and an increased sense of well-being. Email “Russell Wilson has made a bizarre claim about how he prevented a concussion”. 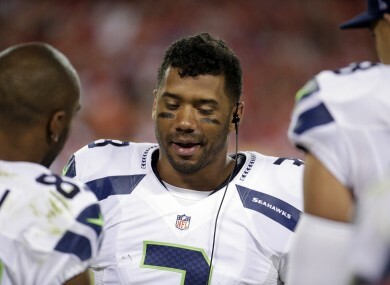 Feedback on “Russell Wilson has made a bizarre claim about how he prevented a concussion”.